What can we do with anti-fascism? ...The dissonance lies in the content of these arguments. But by remaining in the content, crystallising itself in the place for saying (and even doing) they could also become elements of recuperation, food for future conservative thought, new uniforms (of a different colour), new ‘idols’ (in a more agreeable format). There are no definitive recipes, not even dissonances, capable of breaking the rhythm that constantly envelops us. Yet dissonance has something else to offer. Something meaningful appears in the crossroads of rhythms between re-evoked facts, the time of writing and the time of fruition, that is, in the task freely taken on by the reader. One perceives a content which is something other than the single arguments, the ways of saying and the saying of ways. In letting oneself be struck by dissonance one is not illuminated, one does not fall prostrate on the road to Damascus but simply creates air around one’s thoughts, that is, one lets inadvertence enter the field of codification. The range of arguments itself opens the way to unpredictable unions that were not intended during the phase of writing, and were probably not problems as such even in the factual phase. Dissonance therefore acts like a catalyst for casual openings that cannot be controlled. Just one warning: do not let yourself get panicky about meaning. 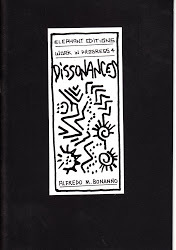 If dissonance is an integral part of harmony and constitutes the other outcome, one that is always foreseeable and even desirable, its free coagulation in processes of aleatory fruition produces something else, a rupture that is not easily amendable. May others respect the complete cycle in the reassuring riverbed of meaning, with which the water carriers quench our fears, but elsewhere. Here one is proposing a reading that is itself a risk: a chance, a journey open to other possibilities. Chance is yet to be discovered, if nothing else in its connection with chaos. But even that is yet to be discovered, at least in connection with spontaneous order. See you elsewhere. The fox knows many things. The porcupine only one, but it is great. Fascism is a seven-letter word beginning with F. Human beings like playing with words which, by partly concealing reality, absolve them from personal reflection or having to make decisions. The symbol acts in our place, supplying us with a flag and an alibi. And when we put ‘anti-’ in front of the symbol it is not simply a question of being against what absolutely disgusts us. We feel safe that we are on the other side and have done our duty. Having recourse to that ‘anti-’ gives us a clear conscience, enclosing us in a well-guarded and much frequented field. Meanwhile things move on. The years go by and so do power relations. New bosses take the place of the old and the tragic coffin of power is passed from one hand to the next. The fascists of yesteryear have complied with the democratic game and handed over their flags and swastikas to a few madmen. And why not? That is the way of men of power. The chit-chat comes and goes, political realism is eternal. But we, who know little or nothing of politics, are embarrassedly asking ourselves whatever has happened given that the black-shirted, club-bearing fascists we once fought so resolutely are disappearing from the scene. So, like headless chickens we are looking for a new scapegoat against which we can unleash our all-too-ready hatred, while everything around us is becoming more subtle and mellow and power is calling on us to enter into dialogue: But please step forward, say what you have to say, it’s not a problem! Don’t forget, we’re living in a democracy, everyone has the right to say what they like. Others listen, agree or disagree, then sheer numbers decide the game. The majority win and the minority are left with the right to continue to disagree. So long as everything remains within the dialectic of taking sides. No, not at the level of small talk. Differences get hazy over a glass of good wine and everything becomes a matter of opinion. Because, and this is the important thing, there are differences, not between fascism and antifascism but between those who want power and those who fight against it and refuse it. But at what level are the foundations of these differences to be found? The fact is that historians are useful, especially for supplying us with elements of comfort, alibis and psychological crutches. How courageous the Communards of 1871 were! They died like brave men against the wall at Père Lachaise! And the reader gets excited and prepares to die as well if necessary, against the next wall of the Communards. Waiting for social forces to put us in the condition of dying as heroes gets us through everyday life, usually to the threshold of death without this occasion ever presenting itself. Historical trends are not all that exact. Give or take a decade, we might miss this opportunity and find ourselves empty handed. If you ever want to measure a historian’s imbecility, get him to reason on things that are in the making rather than on the past. It will be a mind-opener! No, not historical analysis. Perhaps political or political-philosophical discussion, the kind we have become accustomed to reading in recent years. Fascism is something one minute, and something else the next. The technique for making these analyses is soon told. They take the Hegelian mechanism of asserting and contradicting at the same time (something similar to the critique of arms that becomes an arm of criticism), and extract a seemingly clear affirmation about anything that comes to mind at the time. It’s like that feeling of disillusionment you get when, after running to catch a bus you realise that the driver, although he saw you, has accelerated instead of stopping. Well, in that case one can demonstrate, and I think Adorno has done, that it is precisely a vague unconscious frustration—caused by the life that is escaping us which we cannot grasp—which surges up, making us want to kill the driver. Such are the mysteries of Hegelian logic! So, fascism gradually becomes less contemptible. Because inside us, lurking in some dark corner of our animal instinct, it makes our pulse quicken. Unknown to ourselves, a fascist lurks within us. And it is in the name of this potential fascist that we come to justify all the others. No extremists, of course! Did so many really die? Seriously, in the name of a misunderstood sense of justice people worthy of great respect put Faurisson’s nonsense into circulation. No, it is better not to venture along this road. When knowledge is scarce and the few notions we have seem to dance about in a stormy sea, it is easy to fall prey to the stories invented by those who are cleverer with words than we are. In order to avoid such an eventuality the Marxists, goodly programmers of others’ minds that they are (particularly those of the herded proletariat), maintained that fascism is equivalent to the truncheon. On the opposite side even philosophers like Gentile suggested that the truncheon, by acting on the will, is also an ethical means in that it constructs the future symbiosis between State and individual in that superior unity wherein the individual act becomes collective. Here we see how Marxists and fascists originate from the same ideological stock, with all the ensuing practical consequences, concentration camps included. But let us continue. No, fascism is not just the truncheon, nor is it even just Pound, Céline, Mishima or Cioran. It is not one of these elements, or any other taken individually, but is all of them put together. Nor is it the rebellion of one isolated individual who chooses his own personal struggle against all others, at times including the State, and could even attract that human sympathy we feel towards all rebels, even uncomfortable ones. No, that is not what fascism is. For power, crude fascism such as has existed at various times in history under dictatorships, is no longer a practicable political project. New instruments are appearing along with the new managerial forms of power. So let us leave it for the historians to chew away on as much as they like. Fascism is out of fashion even as a political insult or accusation. When a word comes to be used disparagingly by those in power, we cannot make use of it as well. And because this word and related concept disgusts us, it would be well to put one and the other away in the attic along with all the other horrors of history and forget it. Forget the word and the concept, but not what is concealed under it. We must keep this in mind in order to prepare ourselves to act. Hunting fascists might be a pleasant sport today but it could represent an unconscious desire to avoid a deeper analysis of reality, to avoid getting behind that dense scheme of power which is getting more and more complicated and difficult to decipher. I can understand anti-fascism. I am an antifascist too, but my reasons are not the same as those of the many I heard in the past and still hear today who define themselves as such. For many, fascism had to be fought twenty years ago when it was in power in Spain, Portugal, Greece, Chile, etc. When the new democratic regimes took their places in these countries, the anti-fascism of so many ferocious opponents extinguished itself. It was then that I realised the anti-fascism of my old comrades in struggle was different to mine. For me nothing had changed. What we did in Greece, Spain, the Portuguese colonies and in other places could have continued even after the democratic State had taken over and inherited the past successes of the old fascism. But everyone did not agree. It is necessary to know how to listen to old comrades who tell of their adventures and the tragedies they have known, of the many murdered by the fascists, the violence and everything else. ‘But’, as Tolstoy again said, ‘the individual who plays a part in historical events never really understands the significance of them. If he tries to understand them he becomes a sterile component.’ I understand less those who, not having lived these experiences, and therefore don’t find themselves prisoners of such emotions half a century later, borrow explanations that no longer have any reason to exist, and which are often no more than a simple smokescreen to hide behind. In such cases my almost spontaneous reply is—no, I am not an antifascist. I am not an antifascist in the way that you are. I am not an antifascist because I went to fight the fascists in their countries while you stayed in the warmth of Italian democracy which nevertheless put mafiosi like Scelba, Andreotti and Cossiga in government. I am not an antifascist because I have continued to fight against the democracy that replaced these soap opera versions of fascism. It uses more up to date means of repression and so is, if you like, more fascist than the fascists before them. I am not an antifascist because I am still trying to identify those who hold power today and do not let myself be blinded by labels and symbols, while you continue to call yourself an antifascist in order to have a justification for coming out into the streets to hide behind your ‘Down with fascism!’ banners. Of course, if I had been older than eight at the time of the ‘resistance’, perhaps I too would be overwhelmed by youthful memories and ancient passions and would not be so lucid. But I don’t think so. Because, if one examines the facts carefully, even between the confused and anonymous conglomeration of the anti-fascism of political formations, there were those who did not conform, but went beyond it, continued, and carried on well beyond the ‘ceasefire’! Because the struggle, the life and death struggle, is not only against the fascists of past and present, those in the black shirts, but is also and fundamentally against the power that oppresses us, with all the elements of support that make it possible, even when it wears the permissive and tolerant guise of democracy. But I think it is useful to draw distinctions. I have never liked fascists, nor consequently fascism as a project. For other reasons (but which when carefully examined turn out to be the same), I have never liked the democratic, the liberal, the republican, the Gaullist, the labour, the Marxist, the communist, the socialist or any other of those projects. Against them I have always opposed not so much my being anarchist as my being different, therefore anarchist. First of all my individuality, my own personal way of understanding life and nobody else’s, of understanding it and therefore of living it, of feeling emotions, searching, discovering, experimenting, and loving. I only allow entry into this world of mine to the ideas and people who appeal to me; the rest I hold far off, politely or otherwise. I don’t defend, I attack. I am not a pacifist, and don’t wait until things go beyond the safety level. I try to take the initiative against all those who might even potentially constitute a danger to my way of living life. And part of this way is also the need and desire for others—not as metaphysical entities, but clearly identified others, those who have an affinity with my way of living and being. And this affinity is not something static and determined once and for all. It is a dynamic fact which changes and continues to grow and widen, revealing yet other people and ideas, and weaving a web of immense and varied relations, but where the constant always remains my way of being and living, with all its variations and evolution. I have traversed the realm of man in every sense and have not yet found where I might quench my thirst for knowledge, diversity, passion, dreams, a lover in love with love. Everywhere I have seen enormous potential let itself be crushed by ineptitude, and meagre capacity blossom in the sun of constancy and commitment. But as long as the opening towards what is different flourishes, the receptiveness to let oneself be penetrated and to penetrate to the point that there is not a fear of the other, but rather an awareness of one’s limitations and capabilities—and so also of the limits and capabilities of the other—affinity is possible; it is possible to dream of a common, perpetual undertaking beyond the contingent, human approach. The further we move away from all this, affinities begin to weaken and finally disappear. And so we find those outside, those who wear their feelings like medals, who flex their muscles and do everything in their power to appear fascinating. And beyond that, the mark of power, its places and its men, the forced vitality, the false idolatry, the fire without heat, the monologue, the chit chat, the uproar, the usable, everything that can be weighed and measured. That is what I want to avoid. That is my anti-fascism. There are at least two ways to make music. The negative one and the positive one. We can screech as long as we like on the strings of a violin and still not succeed in making what comes out music. But a whole portfolio of scores of the great composers still does not make a musician. It follows that one should not pay attention to how things are said as much as to what is being said. There is as much violining about drugs today as there is about everything else. Each plays their own way, with their own purposes. There are those who talk with an air of personal authority, although when it comes down to it, all they know is hearsay. This science reaches them through others’ experience, it is an outside affair. They have observed matters that are not their own, gathering ‘eye-witness accounts’ that are mere signals, not reality. It matters little then in my opinion whether one adopts a permissive attitude or makes apocalyptic forecasts. Then there are the usual scoundrels who call for politically opportunistic projects great or small, but here again the difference is irrelevant. And there are those who are disarmingly in good faith, those ‘in good faith’ by profession, who almost make a shield of their state of grace to hide behind, timidly insisting that ‘something must be done’ (which usually results in no more than a worthy refurbishment of some of the more antiquated forms of social services). Not forgetting the anti-mafia violinists who combine their prolific activity with the ‘drugs problem’—the two are clearly interdependent—and it becomes a point of honour to repeat the paradoxical rubbish that is said about the ‘mafia’ when talking about ‘drugs’ word for word. And finally there are the more advanced ‘revolutionaries’ who can be divided into roughly two positions, each one comical, but for different reasons. The first is permissive, but only up to a point. They are for the use of ‘light’, not ‘heavy’ ‘drugs’. They are broad-minded to the point of becoming consumers themselves at times. With revolutionary asceticism of course, using small amounts of ‘light drugs’, taking care to have only a little close at hand so as not to have problems with the law, as that would be out of keeping for a revolutionary. The second position is the absolute condemnation of all drugs, ‘light’ or ‘heavy’, it makes no difference: they all ‘dull your faculties’. These ‘revolutionary’ positions are clearly lacking in something. The difference between ‘light’ and ‘heavy’ drugs has always seemed spurious to me, partly because the difference is defined by the legal laboratories of the system. And it seems to me to be too hasty to establish once and for all that drug addicts are idiots with no backbone, incapable of self-managing their lives and so are like lumps of wood at the mercy of the whirling river of power relations. The stupid and superficial, the weak and uncertain, those desirous of uniformity at any price, will rally under any flag, including the revolutionary one. Next to me under the same flag I have heard them gasp in situations that were too strong for their humanitarian palates or whatever lies under their lion’s disguise. I have even seen them hide their weaknesses behind attitudes worthy of mountain-crushing judges. We nearly all need some kind of prop, I’m not saying that I do not include myself in this. If nothing else, I take a sleeping pill when I can’t sleep, I eat too much when I am nervous, or other such things. But we are not talking about our weaknesses but of our attitudes towards what we consider to be the weaknesses of others. That is why, if I consider my position carefully, I find the ‘drugs problem’ to be ‘non-news’. I do not feel like subscribing to any of the positions cited above. Nor to the positions of superiority from which some regard ‘drug addicts’ (but it’s more ‘hip’ to call them ‘junkies’). I see things differently. Once again we must start from something obvious: freedom. Of course someone could reply that the young person with very little perspective on choices for gaining knowledge or points of reference, does not have the possibility to start from freedom. So? what should I do? It would be like saying that I am sorry that the exploited have little chance of rebelling because the power structure has been clever enough to sew everything up. In actual fact I am not sorry about such a thing. They have asked for it, with their miserable and petty suggestions of how to force the State to satisfy their needs. And so needs go on being satisfied or postponed, allowing a re-organisation of control and a restructuring of the economy. To such a point that, if not today, then sometime in the near future, the space for rebellion will be reduced to the point of becoming almost nonexistent. If the individual wants to establish a relationship with drugs he is free to do so, but don’t tell me that only one kind of relationship is possible. For a long time now I have considered the situations in which one lived during the Fifties to be different. At the time we were ‘seekers of fire’. Today we can look for a long time, but all we find are zombies crying for a ‘fix’. But I’m not taken in by this kind of whining, which is the same as what can be heard outside any proletarian’s door or any hovel of the most repellent and shameful poverty, without anyone lifting a finger when they walk past the armoured windows of a bank where the safe is open and waiting to be emptied. Of course a ‘social’ problem of poverty and exploitation exists. But there is also a social problem of submission, respectability, piety, acceptance, sacrifice. If the exploited really is a rebel he will certainly not begin by resolving the social problem of ‘all’ the exploited, but will at least try to solve his own without dwelling on the wickedness of capitalism. In the case of his not being physically capable, he must still evaluate what to do with his life himself, before reaching the abjection of simply denouncing his poverty. In saying this I am not saying that I am against the exploited or the poor things who take drugs and stagger about prey to their own ghosts. I feel sorry for them, yes. After all I am a human being too. But I am not prepared to do anything for them. What should I do? Address them to the same old struggle for housing, water, lighting or a pension, just so they can move on to new levels of poverty and discouragement? And what should one do with those larvae in a trance? Give them methadone? Or build them a libertarian and humanitarian hospice? Don’t even mention it to me. I know for certain that the exploited proletarian can rebel, and that if he doesn’t he is also responsible, at least as much as those that exploit him. I know for certain that drug addicts can rebel, and that if they don’t they are also responsible, just as much as those who get rich on their misery. It is not true that privation, work, poverty, drugs, take away one’s will power. On the contrary, they can make it greater. It is not true, as many people without any experience of their own maintain, that heroin (to dwell on the ‘heavy’ stuff for a moment) takes away one’s will power or makes us incapable of acting with a determined project and an awareness of class reality, i.e. of the functioning of the mechanisms that produce, among other things, the drugs market. Anyone who says otherwise either lacks competence or is a mystifier. There is always an awareness of self and self-projectuality in the drug addict, even in those supposedly in the final stages (but what are the final stages?). If the individual is weak, a poor stick with a character already marked by a life of privation or ease (at this point it does not make much difference), he reacts weakly, but he would have done the same thing in any other situation in which he happened to find himself. One could reply that drugs as a prop tend to be sought more by weak subjects. I must admit that this is true. But that does not alter the reasoning (‘non-news’) that I made at the outset, that of pointing out the responsibility of the weak concerning their own weakness. I consider the time has come to say things without mincing words. Racism can be defined in many ways, most of which tend to justify an attitude of defence and attack against other persons who, it is thought, might damage our interests in the immediate or near future. At the root of racism, under its disguise of myths linked to various fantasies and irrationalities, there is always a precise economic cause, in defence of which the fears and fantasies we all have concerning the different are addressed or opportunely solicited. I read a number of articles recently concerning the growth of racism in Italy, in which incredible falsehoods are stated. It seems to me therefore that it would be useful to begin these uncomfortable pieces of ‘non-news’ with a few precise remarks, bearing in mind the context in which I am writing [Bergamo prison] and the consequent impossibility of obtaining precise historical documentation. Racism has existed throughout the history of mankind and has always been linked to a fear of the ‘different’ which has been depicted in the most incredible and fantastical ways. Without going back too far, we can see that for centuries the Catholic church was an instrument both of violent racism and destruction, well before the racist theories of the last two hundred years. It developed the racial theory of blood for the first time, applying it against the Spanish Jews and their desperate attempts to convert to Catholicism in order to survive. In the struggle against the Church and its doctrines last century, scientific theory incongruously introduced a theoretical stream from Chamberlain to Gobineau which took up the blood theory again and used it as a weapon against the Jews. It was placed within a kind of deterministic evolutionism which the modern orthodox racist theory founded by the Nazis based itself upon. But, from the ‘reconquest’ of Spain to our time, these theories would have remained in the locker of the historical horrors of human thought, had they not occasionally found an economic base on which to exercise themselves, common interests to protect, and fears of possible expropriation to be exorcised. The Catholic crusade against the Jews was a consequence of the fear that it would not be possible to control the extremely wealthy Spanish provinces left by the Arabs unless they proceeded to their immediate persecution. Their ghettoisation and consequent control was due to the fact that, having been left almost completely free by the Arabs, they had the levers of the Spanish economy in hand. The vicissitudes of the repression and genocide of the Jews by the Nazis are well known, along with the economic justifications where concrete events were mixed with mythical elements. It is in fact true that with the inflation of the mark—decided mainly under the influence of Jewish managerial groups—the German government had damaged the small savers and salaried workers following their defeat in the first world war. But there was no justification in the subsequent deduction that this was because the Jews acted as a ‘foreign nation’ en bloc, which led to their being condemned to extermination. In this way a significant number of industrialists met their deaths, and along with them, millions of poor souls whose only fault was that they were Jewish. In the same way the problem of the Jamaicans in Great Britain is based on the fact that they have now become a burden to the State. Brought over in tens of thousands immediately after the second world war to bear the brunt of rebuilding the country, the British State would now like them to go back from whence they came, without taking into account the fact that most of the youth, those who make up the most restless element, were born in Britain and have no intention of going off to a place that is quite unknown to them, and from which they never came. Israeli racism against the Palestinians has the same economic basis. Zionist interests can no longer tolerate a reduction in territory, or even a cohabitation which might turn out to be destructive in the long run, possibly resulting in a Palestinian State that is capable of becoming the economic cutting edge of a potentially wealthy Arab world. We should not forget that the Arab intelligentsia is nearly all Palestinian and this scares the Israelis, providing them with a far more powerful motivation to fight than the mythical symbol of the great Israel that was to extend between the two historic rivers. Arab racism, manifested in its continual declarations of ‘holy war’, although never all that solid, also has an economic foundation and is aimed at preventing political isolation and exploitation by other nations during the favourable and limited period of petroleum extraction. Italian racism has also known significant periods which have not limited themselves to theory. Nothing compared to the ‘Teutonic order’ of course, but it reached a considerable level all the same. During its years of publication, the Italian review Difesa della razza, (Defence of Race) edited by Almirante, included many names from the official anti-fascist democratic culture at the time. But never mind. That is trivia compared to the massacres perpetrated by the Italian army in Libya, Ethiopia and Yugoslavia. Each according to their own capabilities. Now the ‘black man’ is making his appearance in the sacred territory of our [Italian] homeland and is starting to become ‘visible’. So long as it was a question of a few dozen ‘blacks’, things could be tolerated. In fact, it excited the superficial democratic sentiments of some, prompting heroic declarations of anti-racism. The same went for the occasional ‘gypsy’ camp and the communities of Chinese, Philippinos, Slavs, Poles, and so on. One continually hears, ‘Very well, these people, even if their skin is a different colour, eat different food, move differently, speak another language, are just like us. But only as long as they stay in their place.’ There, that sums up our anti-racism: the black man, who embodies the most extreme characteristics of racial difference, is just like us, a man, not a beast. But he must understand the ‘good’ we are doing him by giving him the chance to eat the crumbs that fall from our tables laden with every imaginable consumer product. He must learn to work long and unflaggingly and put up with the hardest of labour, be nice and polite, pretend not to understand, get accustomed to putting up with exploitation in the black economy (not because he himself is black), doing temporary work in very small enterprises, pay extortionate prices for a single bed in a rat-infested room, learn our language—given that we are all so ignorant that we do not know how to speak any language other than this useless, peripheral Italian one—and so on. But the ten commandments of anti-racism were valid before the great, more or less rationally planned influx became as consistent as it is now, without any prospect of reduction or regulation. Now it is not just a question of economic damage, but of a real fear of the black man. Although it might sound strange, I have an idea that the real danger at the moment is not some group of Nazi-skins, but comes from a far more profound, deep-rooted feeling that is being experienced irrationally by vast social strata. It is not simply a question of shop-keepers seeing their trade damaged by illegal street sellers, but is also the middle-class white collar workers (among whom you find practically the whole police structure of every order and grade, including the professional military one) and even some salaried but insecure parts of the old factory proletariat who have been leading a trade union battle over the past few years to safeguard the few jobs that are left. The fact that fascist action squads have been recruited in Florence is just a sign, a dangerous one, certainly, but still a sign. More serious still is the consistently racist behaviour of those who possibly consider themselves to be anti-racist. It is this behaviour that is capable of transforming itself within seconds into real conscious racism at some time in the future, and precipitating a catastrophe. The danger comes from the millions of racists who believe themselves to be democratic and anti-racist. This is the ‘non-news’ that we are proposing to comrades to reflect upon. I am from the South, so I am different, and have felt, not only at skin level, how this ‘diversity’ of mine came to be noticed by, and almost disturbed, those used to living in ‘northern’ circles therefore feel superior and even upholders of a ‘language’ they consider superior. I perceived this latent hostility at the end of the Fifties, in the mittel-European cultural circle in Turin, where my stubbornness in continuing to underline my Sicilian accent was considered inaptitude and provincialism. I have participated in conferences and outdoor meetings both in and beyond the anarchist movement, more or less all over Italy, and most of the difficulties I encountered were in Florence and the rest of Tuscany. I am not saying that the Tuscans are worse than others. I have Tuscan friends and comrades who are among the best people in the world, but there is in them, in all of them, the conviction that they ‘speak Italian’, that they are the recipients of the mother tongue without having had to face the obstacle of getting rid of their dialect. This mistaken starting point, which makes them not only speak badly but write even worse (always with the obvious exceptions), is an element of latent racism. Knowledge is acquired by study, not from the natural gift of being born in a given place. This is a dangerous concept. Italian is an artificial language that is composed of many elements which, like all other languages, are still in the course of transformation. This goes for dialects too of course, but the lesser capacity of dialects and languages reduced to such a range, to ‘build’ their own literature and make it known, encloses them within a fairly circumscribed territorial space. I have always refused to ‘refine’ my accent in a ‘correct’ way, precisely so as not to be colonised like most of those who breathe the so-called ‘air of the continent’. After a period in Milan they sound like pure-blooded Milanese when they return to their native Canicatti. Defence of one’s identity, along with an—intellectual and practical—consistency, always gives rise to a reaction of annoyance and fear. This happens with the homosexual, whom our democratic antifascist culture considers ‘different’ and tolerates so long as he is recognisable, i.e. assumes the attitude of a ‘would-be woman’ that allows us to identify him and keep him at a distance, naturally with great tolerance. But the homosexual who to all appearances is ‘a man like us’ puts us in difficulty, scares us, is the one we fear most. Basically, we have all built a well-ordered world with our certainties and reassurances, and we cannot accept someone ‘different’ turning up and upsetting everything in just a few seconds. In the same way there is latent, therefore unconscious, racism in any attempt at defence that demonstrates the importance and validity of one ethnic reality without linking it to another and pointing out their intrinsic diversity as well as the profound community of interests that exists between them. When I took up the subject of the national liberation struggle many years ago, there were two reactions, both wrong in my opinion. On the one hand, there were those who said right away that such a thematic was right-wing, with goodbye to all the work of Bakunin and comrades and almost the whole of the international anarchist movement. On the other, there were those who took it up, turning it into a local affair aimed at going into its social characteristics, ethical or otherwise, without linking it to the international context as a whole. Another undercurrent of racism, which runs through the whole of present-day anti-racism, is that of the political verbalism in favour of this or that struggle for the liberation of the South African blacks, the Palestinians, the British blacks, the Kanaks and so on. International solidarity in words alone is a form of latent racism, in fact it is even subscribed to by illuminated governments and respectable groups who spread the good word throughout the world. But when it comes to examining what could be done to support that solidarity concretely, what could be done to damage the economic interests of those responsible for the repression, then things change, and a respectable distance is taken from them immediately. It is another aspect of the anti-racism that tolerates the black man so long as he stays in his place, a different way of keeping a distance, of putting one’s conscience at rest and have racism carry on at a safe distance from one’s own doorstep. So, here in this country, we have reached the point of believing it possible for police and carabinieri to become the paladins and defenders of the blacks, in other words the supporters of the anti-racist politics of the Italian government. But is such a thing possible? Anyone who has seen these murderers in uniform at work even once can have no illusions on the subject. These armed corps, for the most part composed of people from southern Italy, once their ‘bread and butter’ is safe, become the most ferocious jailers of other people from the south, those who dream of the possible clash that could bring about changes capable of putting the old ideals of their fathers—a piece of bread—in question once again. And if that is what they thought and continue to think as far as the South is concerned, imagine what their attitude will be concerning blacks, Philippinos, gypsies, Poles and so on. Anything but democratic tolerance. The other day, in their haste to beat up their victims (quickly and well do not go together), they did not realise that they were also beating up one of their (parliamentary) colleagues who unfortunately has a black face. Here the racism is anything but latent, but let us put it all in the same category of possible, not certain, danger. But even workers can be convinced of a ‘black’ danger from the immigrants who have arrived to take what little work is left from them. Massive shifts in this direction find the trades unions and political representatives, who have always worked out their strategy on the element of economic and normative safeguard alone, disarmed. Any humanitarian discourse would rebound on them. In a short time they would be obliged to become the defenders of an institutionally separate working strata, underpaid and guaranteed in a different way, with lower wages and fewer protective measures, in short a kind of apartheid. Such a logic is applied in the United States regularly without half terms, and differentiated conditions have only begun to be reduced in recent years parallel to an unprecedented growth in the rage, not only of the blacks, but mainly of other immigrants such as Puerto Ricans, Cubans, Mexicans and so on. At the root of this problem, which can supposedly be resolved by power, there is one great obstacle: real, concrete anti-racism, should start from real equality between everyone, men and women, of any race whatsoever, wherever they come from, whatever their culture and religion. But no State could ever bring about, or even consider, concrete equality, so all States are destined to become hotbeds of racial conflicts that no verbal respectability will succeed in camouflaging very well. Explosions of violence, in the one and the other sense, will always be possible unless the social and economic conditions that produce class stratification and differences are eliminated. Racism is an economic problem, and like all economic problems it can only be resolved with a revolutionary break. One concludes that it is indispensable for revolutionaries to differentiate themselves from all those—and they are numerous—who say they are anti-racist, starting from democratic governments of half the world to the so-called governments of the ex-real socialist States, where racism has also always existed, just as inequality has. It is necessary to differentiate oneself in practical terms from the scoundrels who say they are anti-racist, by attacking with precise actions all the symbols of racism and its supporters as they develop and emerge. At the same time it is necessary to work out a critique of the fears and irrational impulses that lurk inside us all concerning everything that is different, in order to reduce the subsoil where the most stupid, visible, racism finds its inexhaustible fuel. One of the projects that capital is putting into effect is the reduction of language. By language we mean all forms of expression, particularly those that allow us to articulate complex concepts about feelings and things. Power needs this reduction because it is replacing straightforward repression with control, where consensus plays a fundamental part. And uniform consensus is impossible in the presence of multiform creativity. The old revolutionary problem of propaganda has also changed considerably in recent years, showing up the limitations of a realism that claimed to show the distortions of the world to the exploited clearly, putting them in the condition to become aware of their situation. Still in the historical sphere of anarchism, we have the quite exceptional example of Malatesta’s literary capacity based on a language that was essentialised to the maximum degree, constituting a model unique for its time. Malatesta did not use rhetoric or shock effects. He used elementary deductive logic, starting off from simple points based on common sense and ending up with complex conclusions that were easily understood by the reader. Galleani worked at quite a different linguistic level. He used vast rhetorical constructions, attaching a great deal of importance to the musicality of the phrase and to the use of outdated words chosen to create an atmosphere that in his opinion would move spirits to action. Neither of the above examples can be proposed as models of a revolutionary language fit for the present time. Not Malatesta, because there is less to ‘demonstrate’ today, nor Galleani, because there are fewer and fewer spirits to be ‘moved’. Perhaps a wider range of revolutionary literature can be found in France due to that country’s great tradition that has no equal in Italy, Spain or Britain, and due to the particular French spirit of language and culture. At about the same time as the Italian examples mentioned above, we have Faure, Grave and Armand for clarity and exposition, while for research and in some aspects rhetoric, there are Libertad and Zo d’Axa. We should not forget that France already had the example of Proudhon, whose style even surprised the Academy, then Faure who was considered to be a continuation of this great school along with the methodical, asphyxiating Grave. Self-taught, he was an enthusiastic pupil of Kropotkin. The latter’s French was good and basic precisely because, like Bakunin’s, it was the French of a Russian. One could go on forever, from the linguistic, literary and journalistic experiments of Libertad, Zo d’Axa and others, as well as their predecessor Coeurderoy. But although they represent some of the best examples of revolutionary journalism, none of these models is valid today. The fact is that reality has changed, while revolutionaries continue to produce language in the same way, or rather worse. To see this it would suffice to compare a leaflet such as the Endehors by Zo d’Axa with its huge Daumier drawing on one side and his writing on the other, to some of the lapidary leaflets we produce today—looking at our own situation—such as the one we did for the meeting with the comrades from Eastern Europe in Trieste. But the problem has gone beyond that. Not only are our privileged interlocutors losing their language, we are losing ours too. And because we must necessarily meet on common ground if we want to communicate, the loss is turning out to be irreversible. This process of diffused flattening is striking all languages, lowering the heterogeneity of expression to the uniformity of the means. The mechanism is more or less the following, and could be compared to television. The increase in quantity (of new items) reduces the time available for the transmission of each one of them. This is leading to a progressive, spontaneous selection of image and word, so on the one hand these elements are being essentialised, while on the other the amount of transmittable data is increasing. The much desired clarity bemoaned by so many generations of revolutionaries desirous to explain reality to the people, has finally been reached in the only way possible: by not making reality clear (something that is impossible in any case), but making clarity real, i.e. showing the reality that has been built by technology. This is happening to all linguistic expression including desperate attempts to save human activity through art, which is also letting past fewer and fewer possibilities. Moreover, this endeavour is finding itself having to struggle on two fronts: first, against being swallowed up by the flattening that is turning creativity into uniformity, and second, against the opposite problem, but which has the same roots, that of the market and its prices. My old theses on poor art and art as destruction are still close to my heart. Let us give an example: all language, in that it is an instrument, can be used in many ways. It can be used to transmit a code aimed at maintaining or perfecting consensus, or it can be used to stimulate transgression. Music is no exception here, although because of its particular characteristics the road to transgression is even more difficult. Although it seems more direct, it is actually further from it. Rock is a music of recuperation and contributed to extinguishing much of the revolutionary energy of the Seventies. According to Nietzsche’s intuition, the same thing happened with the innovation of Wagnerian music in his time. Think of the great thematic and cultural differences that exist between these two kinds of musical production. Wagner had to build a vast cultural edifice and completely discompose the linguistic instrument in order to captivate the revolutionary youth of his time. Today rock has done the same thing on a much wider scale with a cultural effort that is ridiculous in comparison. The massification of music has favoured the work of recuperation. So we could say revolutionary action operates in two ways, first according to the instrument, which is undergoing a process of simplification and stripping down, then in the sense of its use, which has become standardised, producing effects that cannot always be reduced to a common denominator that is acceptable to all or nearly all. That happens in so-called literature (poetry, narrative, theatre, etc.) as well as in that restricted microcosm, the revolutionary activity of examining social problems. Whether this takes the form of articles in anarchist papers, or leaflets, pamphlets, books, etc., the risks are fairly similar. The revolutionary is a product of his time and uses the instruments and occasions it produces. The chances of reading about the actual conditions of society and production have been reduced, because there is far less to be brought to the surface, and because interpretative instruments have undergone a recession. In a society that was polarised in two clearly opposing classes the task of counter-information was to bring the reality of the exploitation that the power structure had every interest in hiding, out into the open. The latter included the mechanisms for extracting surplus value, repressive stratagems, authoritarian regressions of the State and so on. Now, in a society that is moving further and further towards a democratic form of management and production based on information technology, capital is becoming more and more comprehensible. This is precisely because it is more important for it to be seen, and less important for it to discover new methods of exploitation. Today we need to interpret society with cultural instruments that are not merely capable of interpreting facts that are unknown or treated superficially. We also need to identify an unconscious conflictuality that is far from the old extremely visible class conflict, to avoid being drawn into a simplistic refusal that is incapable of evaluating the mechanisms of recuperation, consensus and globalisation. More than documentation we need active participation, including writing, in what must be a comprehensive project. We cannot limit ourselves to denouncing exploitation but must bring our analyses to within a precise project which will become comprehensible during the course of the analysis itself. Documentation and denunciation are no longer enough. We need something more, so long as we still have tongues to speak with, so long as we have not had them all cut off. It is this new interaction between ways of expressing oneself and one’s project that is the strength of this way of using linguistic instruments, but also leads to the discovery of its limitations. If language has been allowed to become impoverished, adapting to the tendency to its reduction that has been studied and applied by power, then this is inevitable. I have always fought against a kind of detached objectivity in writing that looks at revolutionary questions. Precisely because it is an instrument, linguistic expression always has a social dimension that is summed up in its style. It is not just ‘the man’ as Buffon says, but is ‘man in a given society’. And it is the style that solves the problem, certainly a difficult one, of supplying the so-called deeds of the event along with the indispensable content, their insertion within a project. If this project is alive and up to the conditions of the conflict, the style could be livened up, whereas if the latter is not suitable or is lost in the illusion of objectivity, even the best project will run the risk of losing itself in a ghost-like forest of impressions. Our language must therefore take a form that is capable of supporting our revolutionary content and have a provocatory thrust that is capable of violating and upsetting normal ways of communicating. It must be able to represent the reality we feel in our hearts without letting ourselves get wrapped up in a shroud of logic and only understood with great difficulty. The project and the language used to illustrate it must meet and recognise each other in the style used. Without wanting to take things to the logical extreme of this well-worn thesis, we know today that the instrument constitutes a considerable part of the message. We need to look out for these processes, not let a new pragmatic ideology submerge us in throwaway phrases where there is no relationship between the project and the way of saying it. So, advancing linguistic impoverishment is also reflected in the instruments of communication that we use as revolutionaries. First of all because we are men and women of our time, participants in the reductive cultural processes that characterise it. We are losing instruments like everyone else. This is normal. But we need to make more of an effort to get better results and acquire the capacity to resist these reductive projects. This reduction in stylistic ability is a consequence of the lowering of content. It is also capable of producing further impoverishment, leading to the inability to express the essential part of the project that necessarily remains tied to the means of expression. It is therefore not the ‘genre’ that saves the content, but above all the way this content takes form. Some people make out a schema and never manage to free themselves from it. They filter everything they come to know through this schema, believing it to be ‘their way of expressing themselves’, like having a limp or brown eyes. But it is not like that. One must free oneself from this prison sooner or later, if one wants to make what one is communicating come alive. There are those who choose irony to transmit the urgency they feel, for example. Very well, but irony has its own peculiarities, i.e. it is pleasant, light, a dance, a joke, an allusive metaphor. It cannot become a system without turning out to be repetitive or pathetic like the satirical inserts in the daily papers, or comic strips where we know beforehand how the story is going to end otherwise we wouldn’t be able to understand it, like barrack-room jokes. In the same way, for opposite reasons, the call of reality—the attempt to make reality visible and palpable through communication, starting from the supposition that there can be no immediate fruition from anything that does not seem real—ends up becoming tedious, is unrealisable. We get lost in the constant need to insist, losing the conceptuality that is at the basis of true communication. One of the hackneyed phrases in the museum of everyday stupidity is that we do not know how to say something, whereas the problem really is that we do not know what to say. This is not necessarily so. The communication flux is not unidimensional, but multidimensional: we do not only communicate, we also receive communications. And we have the same problem in communicating with others as we have in receiving from others. There is also a problem of style in reception. Identical difficulties, identical illusions. Again, limiting ourselves to written language, we find that when we read newspaper articles we can reconstruct the way the writer of the article receives communications from the outside. The style is the same, we can see it in the same articles, the same mistakes, the same short-cuts. And that is because these incidents and limits are not just questions of style but are essential components of the writer’s project, of his very life. We can see that the less the revolutionary’s capacity to grasp the meaning of incoming communication, even when it reaches us directly from events, the poorer and more repetitive the interpretation of the latter. The result is, in word and unfortunately also in deed, approximation, uncertainty, a low level of ideas that does justice neither to the complexities of the enemy’s capacity, or to our own revolutionary intentions. If things were otherwise, socialist realism, with its good working class always ready to mobilise itself, would have been the only possible solution. The latest aberration dictated by such ignorance and refusal to consider reality differently was the intervention of the good Rumanian miners to re-establish Illiescu’s new order. Power’s attempts to generalise the flattening of linguistic expression is one of the essential components of the insurmountable wall that is being built between the included and the excluded. If we have identified direct, immediate attack as one instrument in the struggle, parallel to it we must also develop an optimal use of the other instrument at our disposal and take, whatever the cost, what we do not possess. The two are inseparable. Illness, i.e.a faulty functioning of the organism, is not peculiar to man. Animals also get ill, and even things can in their own way present defects in functioning. The idea of illness as abnormality is the classic one that was developed by medical science. The response to illness, mainly thanks to the positivist ideology which still dominates medicine today, is that of the cure, that is to say, an external intervention chosen from specific practices, aimed at restoring the conditions of a given idea of normality. Yet it would be a mistake to think that the search for the causes of illness has always run parallel to this scientific need to restore normality. For centuries remedies did not go hand in hand with the study of causes, which at times were absolutely fantastical. Remedies had their own logic, especially when based on empirical knowledge of the forces of nature. In more recent times a critique of the sectarianism of science, including medicine, has based itself on the idea of man’s totality: an entity made up of various natural elements—intellectual, economic, social, cultural, political and so on. It is in this new perspective that the materialist and dialectical hypothesis of Marxism inserted itself. The variously described totality of the new, real man no longer divided up into the sectors that the old positivism had got us used to, was again encapsulated in a one-way determinism by the Marxists. The cause of illness was thus considered to be due exclusively to capitalism which, by alienating man through work, exposed him to a distorted relationship with nature and ‘normality’, the other side of illness. In our opinion neither the positivist thesis that sees illness as being due to a faulty functioning of the organism, nor the Marxist one that sees everything as being due to the misdeeds of capitalism is sufficient. Things are a little more complicated than that. Basically, we cannot say that there would no longer be such a thing as illness in a liberated society. Nor can we say that in that happy event illness would reduce itself to a simple weakening of some hypothetical force that is still to be discovered. We think that illness is part of the nature of man’s state of living in society, i.e. corresponds to a certain price to be paid for correcting a little of nature’s optimal conditions in order to obtain the artificiality necessary to build even the freest of societies. Certainly, the exponential growth of illness in a free society where artificiality between individuals would be reduced to the strictly indispensable, would not be comparable to that in a society based on exploitation, such as the one in which we are living now. It follows from this that the struggle against illness is an integral part of the class conflict. Not so much because illness is caused by capital—which would be a deterministic, therefore unacceptable, statement—but because a freer society would be different. Even in its negativity it would be closer to life, to being human. So illness would be an expression of our humanity just as it is the expression of our terrifying inhumanity today. This is why we have never agreed with the somewhat simplistic thesis that could be summed up in the phrase “make illness a weapon”, even though it is one that deserves respect, especially as far as mental illness is concerned. It is not really possible to propose to the patient a cure that is based exclusively on the struggle against the class enemy. Here the simplification would be absurd. Illness also means suffering, pain, confusion, uncertainty, doubt, solitude, and these negative elements do not limit themselves to the body, but also attack consciousness and the will. To draw up programmes of struggle on such a basis would be quite unreal and terrifyingly inhuman. But illness can become a weapon if one understands it both in its causes and effects. It can be important for me to understand what the external causes of my illness are: capitalists and exploiters, State and capital. But that is not enough. I also need to clarify my relationship with my illness, which might not only be suffering, pain and death. It might also be a means by which to understand myself and others better, as well as the reality that surrounds me and what needs to be done to transform it, and also get a better grasp of revolutionary outlets. The mistakes that have been made in the past on this subject come from lack of clarity due to the Marxist interpretation. That was based on the claim to establish a direct relationship between illness and capital. We think today that this relationship should be indirect, i.e. by becoming aware of illness, not of illness in general as a condition of abnormality, but of my illness as a component of my life, an element of my normality. And then, the struggle against this illness. Even if not all struggles end in victory. Man has had a taste for risk and adventure and distorted forms of play such as duels and hunting since the beginning of time. Games that put the player’s life on the line also date back to ancient times. But to avoid going too far back in history, it is enough to think of Russian roulette, which everyone remembers from the pages of a great Russian novel, or from scenes in a fairly recent American film. In the Fifties a film about violence in rural America depicted a game called the ‘rabbit jump’, a race between youths, each at the wheel of a car heading towards a cliff edge. The one who jumped out last was the winner. In recent months there have been reports in the news of a ‘motorway roulette’, which consists of driving along a stretch of motorway the wrong way: whoever gets furthest wins. Another game in fashion with Israeli boys, some under ten, consists of placing a schoolbag in the middle of the road and snatching it back when a car approaches. The one who retrieves his last wins. According to news reports a number of children have died playing this game. So why put one’s life on the line? The answer might simply be that it is due to the ‘crisis in values’ of an advanced post-industrial society which has no future to offer young people. Another recent American film showing gang warfare in Los Angeles ended up with a youth who, rather than let himself be arrested, shot a policeman shouting ‘There’s no future!’ And that might be a good answer. The everyday experiences that form the personality have been seriously affected by the profound changes that have taken place in the social and economic structures of advanced industrialised countries over recent years. The thoughts, emotions and actions of individuals are immersed in a situation that has no pre-existing categories to put them in any kind of order and give them any sense of security. This is leading the younger strata, those not able to cope with such a situation or who are not yet in possession of well-rooted interests and ideas, to feel ‘value-deprived’ and unable to ‘give any meaning to life’. Why is this too simple an answer? First, because it does not seem right to me to relegate everything to an underlying social mechanism that explains everything. Behind this mental attitude lurks a kind of neo-determinism that prevents us from grasping the real motivations at the root of things which, if brought out into the open, might give us a better indication of what to do. The social disintegration resulting from economic restructuring in the Eighties is certainly one of the reasons for the chipping away at the values that emerged in the postwar period and remained more or less intact until the end of the Seventies. An institution such as the family, which is turning out to be less and less solid or capable of resolving the important task assigned to it by the bourgeois capitalist society of the last century, is being hit not only by the changing conditions of the world of work and production, but also by the circulation of different ideas, culture, concepts of time and space, and so on. Each of these elements, which it would be simplistic to group together under the term economy, has produced conditions that need to be examined individually. They are of great importance and make up the connective tissue onto which emotions are grafted the thoughts and actions of so many of the young people who come face to face in today’s football stadia and play with their lives in a thousand ways, finding themselves as they do with no future, certainties or hope. Here we are not simply looking at the marginal phenomenon of the late integration of young people into the conditions imposed by social life. This has always existed. What we can see now is a phenomenon of a consistency and extension unknown in the past. And if we want to understand it we must also look at our own thinking patterns. We once thought, and rightly so, that working conditions were central to comprehending the reasons as to why the proletariat engaged in the class struggle, including the revolutionary perspective. But objective conditions are changing. We used to think that the struggles of the working class could at any moment transform themselves into revolutionary consciousness, precisely due to the defects in the system of production as a whole. We can no longer think in such an automatic way. We used to say that one thing that put a brake on the class struggle was the educational integration of young people through the family, the foundation stone of the uniformity of judgement that was completed at school, in the army and at work. Many of these things have now changed. Various concepts have entered the family since its disintegration set in, leading it to breathe an air of paternalism, when not downright puerocracy. Information reaches households directly through television, so the censuring filter of parents no longer functions. The latter have also lost some of the authority that once came from simple physical strength, as there are stricter controls by the State concerning violence towards the under-aged. The old affection, the stuff of seventeenth century oil paintings upon which the family was supposed to be based—for the most part a fantasy of writers and poets—is no longer able to cover up the real lack of feeling that exists within this institution. And we anarchists were among the first to put forward a serious critique of the family as the origin of many of the horrors of the class society. The same goes for school, where, with far-sighted clarity, we saw its limitations and defects in the nineteenth century, proposing a libertarian form of education that has now been taken over by the intellectuals of the regime. I don’t known if we are capable of understanding what is really happening in school today, but it does not seem to me to be a sector in which we are any further behind than others. The level of anarchist analysis today does not seem to be up to comprehending the rapid changes that are taking place in society and the economy. This is demonstrated by what is being said about the problem of production, and, with a constancy worthy of greater things, the insistence on the validity of more or less revolutionary syndicalism. In our opinion, new problems are presenting themselves on the social scene that cannot be faced by using old analyses, even though they might have been correct at one time. In a way, we have not been able to take what we ourselves formulated to its logical conclusion. The example of the family is significant. We were among the first to denounce the repressive functions of this institution but are nowhere near first, today, in drawing the relevant conclusions. The general loss of traditional values does not see us capable of proposing, I would not say substitutes for, but even critiques of other people’s proposals. In the face of the many young people who are asking for a good reason not to put their lives on the line, we do not know what to say. Others have given what we know are not real answers, but the young take them to be such, extinguishing their liberatory aggressiveness and reducing themselves to passive instruments in the hands of power. Others tell them life has a value in itself, because God gave it to us, because it serves pleasure, the Revolution, the continuation of the species, and so on. We know that, taken individually, these statements are not right, but we do not know what to propose as a valid alternative to the game of risk for its own sake. Anarchist practice has fallen sharply in recent years, with few actions either at mass level or at the level of specific groups. As a result we see a revival of the issue of how to get closer to ‘communism’ or to building situations that not only express our ideas and ethical and cultural values but are also capable of satisfying our fundamental personal and collective need for freedom. In other words, there is a proposal to create points of reference that go beyond the classical division between the personal and the political. The problem is that these impulses end up taking two roads which, if examined closely, both lead to the same dead end in the same ghetto. The first, more direct, road is that of desistance: nothing can be done, the enemy is too powerful. We might as well just rely on spreading our ideas (which are superior anyway) and not insist on attack, which only leads to repression, creating more difficulties for the movement in its fundamental activity of propaganda and spreading anarchist theory. The second, more tortuous, road is that of an organisational proposal linked to the idea of community. Many comrades talk of ‘community’, although not always as something confined to one geographical area or in order to satisfy (or try to satisfy) certain needs, even basic ones. It should mean a different way of seeing life, culture, novelty, diversity. ‘Community’ thus escapes the dangers of conservatism or of becoming a mere repetition of empty slogans. But very little is said about this ‘community’ in terms of its structural or other arrangement that could give some idea of its ‘operative’ side. It is seen in terms of a sense of participation, an awareness of the specific contradictions of anarchism (in truth never clear), and the desire for freedom and equality, without the former being realised at the cost of the latter, or vice versa. Why do we believe that this road is equal to the first, that of declared and open desistance? It is easily said. Because the revolutionary struggle is an organisational fact, here and now, not simply a ‘cultural revolution’ (by the use of this term I am not referring to Mao’s cultural revolution, which has nothing to do with us, and which was ‘cultural’ in name only). Because the clash between classes leaves no room for ‘margins’ or free spaces that can be reached through operations carried out within the somewhat polluted currents of philosophical thought. Because the revolutionary always pays in first person, so is aware he will also have to face ‘sacrifice’, i.e. the postponement of projects, delay in the satisfaction of needs. Because anyone who really decides to attack the power of the oppressors cannot reasonably think that the latter will leave them in peace with their ‘ideal’ tensions of freedom and equality. Because if they really want these places of ‘communitarian’ living to be at all tangible in practical terms (and not just a cerebral exercise), they must also give some sign of good will, i.e. pronounce themselves to be against violence, against expropriation, especially in the individual sense, and against active solidarity with those who are really struggling and facing death every day, either at the workplace or in the other places where opposing interests clash. We can talk about the idea of ‘community’ and limit ourselves to that. Very well. Then we should be clear about it. Or we can try to put the idea of community into practice. All right. In that case we should be more specific about communitarian structures, activities, limitations and possibilities. As far as the second point is concerned, we have only a vague critique of self-managed attempts within capitalist situations today, which do not take the many other problems into account. I must say when one finds oneself faced with a myriad of not always edifying historical examples, it is always best to take a step back from an idea, no matter how important, useful or pleasant the latter might be. And the problem of ‘community’ is undoubtedly of this kind. Let us take a look at it. The idea of ‘community’ is not specific to anarchists. On the contrary it has been developed throughout philosophical thought (the academic codification of the ideas of the dominant class) in opposition to the concept of ‘society’. Leaving aside the specific use that Plato, Fichte and Hegel made of the idea of ‘community’, one example that needs to be borne in mind is Marx and Engel’s analysis of the primitive community in which the history of humanity began. This was to become a final community where the history of the proletariat and the class struggle were to resolve themselves. Such philosophical determinism reaches its full tragi-comic expression in Stalin’s theories of ‘community’ that stand up well alongside the theories of the National Socialists, who were not just theoreticians but ‘almost’ architects of a ‘community of a sacred culture and people’ (by force, of course). So far we are clearly within the area of a supra-national interpretation of the concept of ‘community’. But another elaboration of this concept has been realised in the workshops of academia, one that comes closest to the ideas that are being discussed in the anarchist movement today. This sees ‘community’ not as a supranational entity, but as a particular link between individuals, in other words as a ‘social relation’. According to this way of seeing things, individual relations are brought about by common interest, creating interaction that serves to amalgamate the ‘community’. This concept was first formulated by the German Romantic school, by a theoretician of religion (Schleiermacher) to be precise, in 1799, and his ideas are undoubtedly linked to his concept of ‘religion’ which means ‘to bind together’ or ‘tie together’. Then in 1887 Tönnies, in a more detailed formulation, described community as a natural organism within a kind of collective will aimed at satisfying prevalently collective interests. In this organism, individual urges and interests atrophy to a maximum degree, while the cultural orientation tends to reach an almost sacred dimension. There is global solidarity between all members. Property is held in common. Power (at least as it is understood today) is absent. The model presented by Tönnies for his analysis is that of European rural society, in the peasant villages. Kropotkin, for his part, drew on other realities (that of the Russian ‘mir’) and from other anthropological literature (in the English language), but had a fairly similar model in mind. In my opinion the error lies in believing that it is natural to act in a way that is both specific to certain communitarian situations, and to the historical course of a communitarian feeling that existed among certain peoples before the disintegration of the social order. In other words it was thought that some communitarian institutions had survived destruction by the modern State and continue to exist in incomplete forms that are still visible today, such as the family (or extended family), neighbourhood groups, co-operatives, etc. This is all really quite naive. Less naive, but just as mistaken (therefore dangerous), is the point of view of those who say that community is a ‘union’ that is felt ‘subjectively’ by its members, whereas society is only understood through an objective arrangement. None of this detracts from the feelings of solidarity, equality and the refusal of individual power and property that the exploited have been capable of realising in quite well-defined forms. Just as it does not detract from the concept of self-organisation, spontaneous creativity and projectuality of those who are against power. it would be far from easy to separate the concept of ‘community’ from its original rural and peasant base with all the implications that are now far off in time and certainly in contrast to a general situation of profound technological change. It seems to me that we can wind up by simply saying that there is no need to have recourse to concepts such as ‘community’, which carry pollutants that are not easy to filter out, in order to point to the effective capacity for self-organisation that the exploited possess. When this concept is used to refer to a possible organisational form, deceiving oneself that it would overcome the limits and contradictions, dangers and traumas that revolutionary anarchist activity inevitably carries with it in a situation of profound social laceration such as the present, I must stress my disagreement.